We are biased in favour of our expert craftsmanship and personal service that exceeds expectations. You’d probably like to know what our clients say about us, so here are some of the unsolicited testimonials we’ve received. The workmen arrived very early on the day as arranged and got to work straightaway in preparing the site for a new driveway. Tony and Tim were particularly hardworking and their experience shone. Every day before I went to work I was advised of the day’s planned progress, and the end result is excellent. My driveway looks stunning. 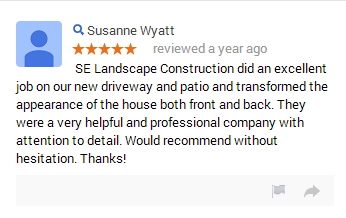 I was looking for quality in a contractor and SE Landscape Construction gave me that. I would not hesitate in recommending them. After many quotes we were confident that SE Landscape Construction was the right company to take on our project to transform our new home that we recently moved into. The 3D designs they gave us were really helpful in visualising how our home would look after the transformation. We wanted a new driveway & patio and the hedges replaced with fencing as well as a gate.The preparation, excavation and removal of our old driveway and patio were left with little disruption to us both & at each close of day they always ensured that we had areas to walk on to and from the house.Throughout the job, SE Landscape Construction worked to a very high standard of professionalism, method and skills; their creativity and design in hard landscaping is exceptional and the results are phenomenal, such excellent craftsmanship in our view.Thank you for all your hard work and we look forward to enjoying the results over the coming years! Thank you for my wonderful patio. I am very impressed by your workmanship, tidiness and the overall finish. I would be more than happy to recommend you to friends and family. 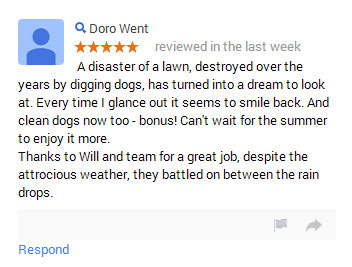 Just a quick note to say how happy we are with the job SE Landscape Construction did for us. The patio, walling and new turf looks fantastic and has made such a difference to our back garden! Just to add my personal thanks for everything you have done to help us. The front garden is exactly how we envisaged. All of our neighbours have said how impressed they are and we have even had 2 strangers knocking on the door asking us about our garden. Thank you so much.